I started with Herding dogs in the late 60’s as I lived on several acres with 100 head of registered Polled Herefords and needed some help! Indian Runner ducks were also added to start puppies. During this time I opened a grooming, boarding and retail pet supply business. Then started pet obedience classes with the area Adult Education Program. I was fortunate to have started with some wonderful dogs, mostly Las Rocosa, Sunnybrook and Countrywoods breeding. They taught me much about herding, training and breeding. When breeding I look for a versatile dog in Aussies and Vallhunds as I want the dog to have the ability to compete in all areas of competition, but most of all, I want the dog to be a good family companion. The versatility includes good structure, relating to the breed standard and good temperament as both go hand in hand. My dogs are eye checked each year and all hips are done before breeding. 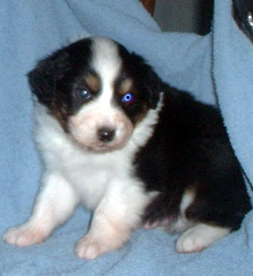 I only breed “good” and better hips, clear eyes and “good” and better elbows in Aussies. All the dogs that I feel are not a productive compliment to the breed are put out on spay or neuter contracts. Puppies are raised in home, temperament tested at eight weeks, with reports kept on each puppy. This helps to make sure the puppy is placed in the correct home. The testing also contributes to what training will need to be done with each puppy. The puppies are all exposed to at least seven different surfaces by the age of eight weeks. They are also socialized in home and outside of the home. This helps puppies become comfortable with different situations.